Because I know that family and some friends are wondering how Ernie is doing now that I’m 3000 miles away from him, I’m blogging about Ernie. 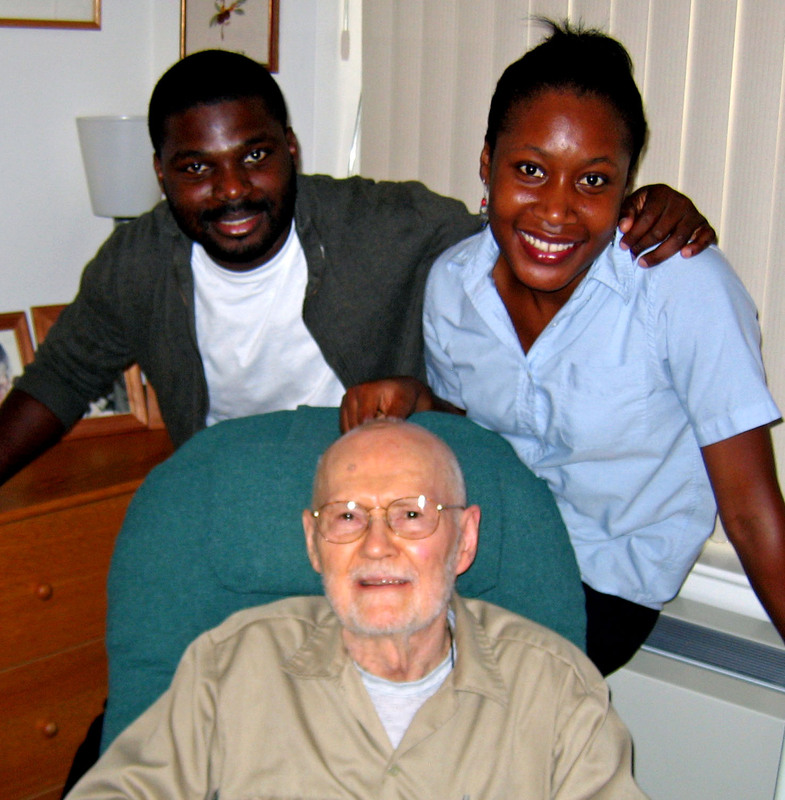 Here’s Ernie with our friends Yemi and Ara, the week before I left him there. Yemi is in graduate school. Ara is a nurse with a bachelor’s degree and the intention of pursuing post-grad degrees. To recap, Ernie started talking to me about me leaving Charlestown a year or so before the thought was thinkable to me. We had moved to Charlestown so that each of us would be cared for as needed until we died, without having to depend upon our children. Ernie began talking about me leaving Charlestown well before he moved to assisted living in RGT. He saw how sick I was, living there. He worried that I would relapse into ME/CFS. But then the talk was about me leaving when he died. In 2010 he was thought to be dying. When he didn’t die, we realized that we might be in for a long, slow decline, that he could last a long time. Then in January 2011, he had to be moved to RGT; and I got sicker. When son Geoff challenged me to think about leaving Charlestown, I told Ernie that I might not last as long at Charlestown as he might. He said I should go. He didn’t want me being sick. That was before I had any intention of acting upon the idea. You all know what happened next–an excruciating separation with the consequences completely unknowable. It was indescribably difficult, and still is, sometimes. Mostly, however, I am happily settling in to a radically different life, despite occasional bouts of anxiety. My physical symptoms have significantly abated. I’m feeling much less sick. In fact, most of the time, I feel great. Now, what about Ernie? Every day we talk by phone. We are having as much conversation daily as we had when I was going to be with him in RGT every afternoon–at about the same time (for him). Every evening I send him an e-mail message that is delivered to him the next day. Since his stamina for conversation is limited, he prefers to read; and this way I can tell him more about my life. Every week I send him a letter with lots of pictures, so he can see where I’ve been, what I’ve seen, and what my place looks like as I get organized. I print and mail him my blog posts, so he reads what I write for you, just as he did when he could use his computer. He assures me that he is okay and that he is very happy, knowing that I am doing well. There have been events along the way. He has figured out how to deal with situations I would have taken care of had I been there. He arranged to have his laundry done. He found an aide who would trim his hair and beard. When his walker tray got separated from the walker, he got it fixed. He has bought toiletries at the RGT “store”, which is set up in the Activities Room on Tuesdays. When he reported to me that his hip had begun causing him to limp, I told him to talk to the nurse, which he did. When he was taken by wheelchair to the Medical Center and became sick and faint sitting in the chair, he told the receptionist who found a place for him to lie down. When his aide took his only blanket to be laundered, I told him to ask for another blanket. Instead, he decided to sleep in his thermal underwear and socks the one night he was without the blanket. These are all things I would have attended to had I been there, and there have been other such incidents. I have asked him if he wanted me to act. In each case, Ernie has talked with me about it and dealt with it. He is doing more for himself than I was allowing him to do. The staff have been wonderful. Because they know both of us and our story, and because Ernie is so pleasant and appreciative, he gets extra attention. Just as I did when I was living at Charlestown, I talk with the receptionists who print and deliver my e-mail and with the aides who are sometimes in his room when I call. I’m in touch with his nurses and his social worker. A few days ago, when I phoned him, he was in his doctor’s office for a routine check-up. He handed the phone to the doctor, who also knows me well, and he reported on Ernie’s status–nothing new. Hearing from me audibly and in writing every day and knowing that I am glad to be here has kept Ernie in good spirits–according to him and the staff. Of course we know that the status quo will not last. Frequently, Ernie tells me that he notices further signs of decline. He says he is weaker and less able to concentrate. He isn’t reading magazines anymore. It’s all he can do to get through The Washington Post over the course of a day. He still follows sports on TV. More and more of his time, however, is spent on the bed, resting and relieving his constant back pain. As his situation changes, I have no idea how we’ll deal with it. At present, Ernie seems to be okay. Now it’s time for me to call him. Now that I’m on Vashon I am ambivalent about blogging. First of all, I’m ambivalent about posting to “Parkview 616” because I don’t live there anymore. 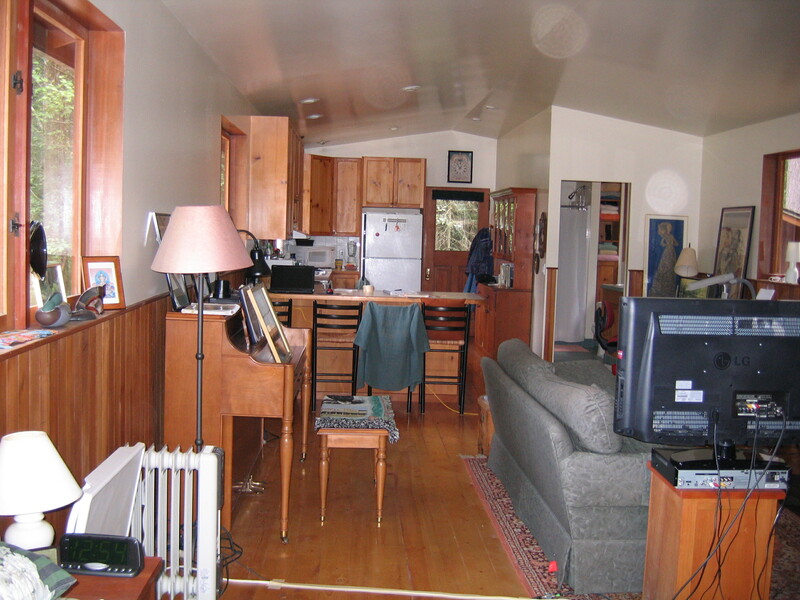 When I started this blog in 2007, not only was I living in that apartment, I was mostly housebound and spending almost all my time in the room with that view at the top of my blog. Secondly, I began to blog at the urging of other stitchers with whom I was participating in online courses and challenges. They’d read my comments on their posted photos and blogs and they’d seen my photos at group sites. After wondering for a while whether I wanted to spend any of my limited activity time and energy writing a blog, I did so with the main intention of communicating with fellow stitchers. I made that intention clear in the subtitle, “About my life in stitches.” I thought I was just going to show and tell my needleart. As you know, my life has changed radically since then. In fact, since my recovery in 2009, I’ve not been able to do any serious, sustained needlework because of ADHD and my “allergic” reaction to my living situation at Charlestown. So instead I’ve posted about the changes and challenges in my life after ME/CFS. While I was housebound, I thought that I had found a new vocation–learning to make needleart. It was about five years after my collapse forced me into disability retirement and seclusion that I discovered a passion for making things with needle and thread, and then all sorts of other materials. Until then it had never occurred to me that I could make visual art. In fact, I was sure that I couldn’t; but I had to find something to do, some way to be productive, to have a satisfying life. I began to take needlework seriously, studying it, working at it, learning how to design, learning new ways of working, and trying to improve my skills. In 1997 I wrote that as a corporate manager and consultant, I had made things happen. Now I made things. Every aspect of the process brought me intense joy and satisfaction. Learning new techniques and working with new materials was such fun. Sharing what I was learning and making was also very rewarding. I miss that. But so far, I haven’t wanted to finish the needlebook cover that I had designed and kitted for traveling before my first trip to Vashon in July. Unable to work because of the ADHD I’ve had since recovery, I seem to have lost the passion I had for designing and stitching. Maybe that was just my vocation when I couldn’t be out in the world. 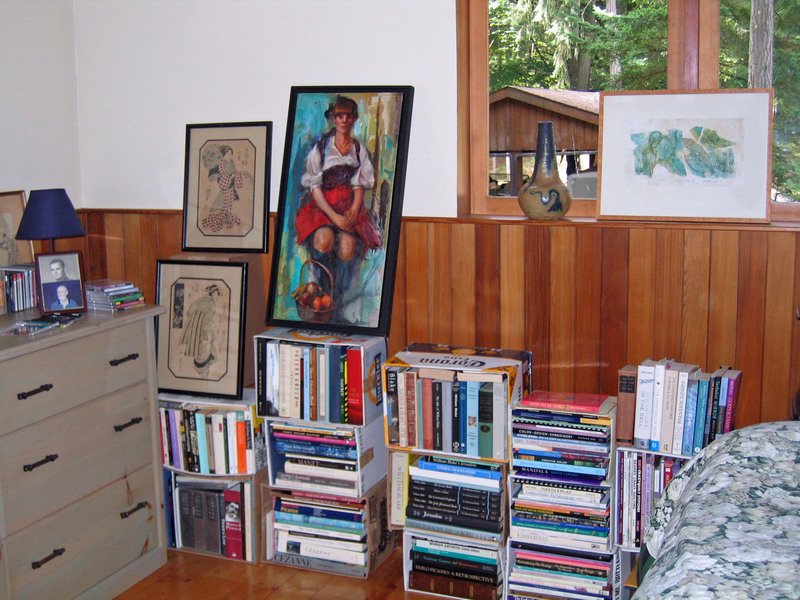 As for being out in the world, here’s a bit of an update about my life on Vashon. I’m getting my place organized. It was immensely comforting to unpack my books and get all of them where I can see them. I know where each one is now. Some are in the hutch in the kitchen area. The rest are in boxes, improvised as bookcases. I’ve got most of my art placed approximately where I want to hang it. 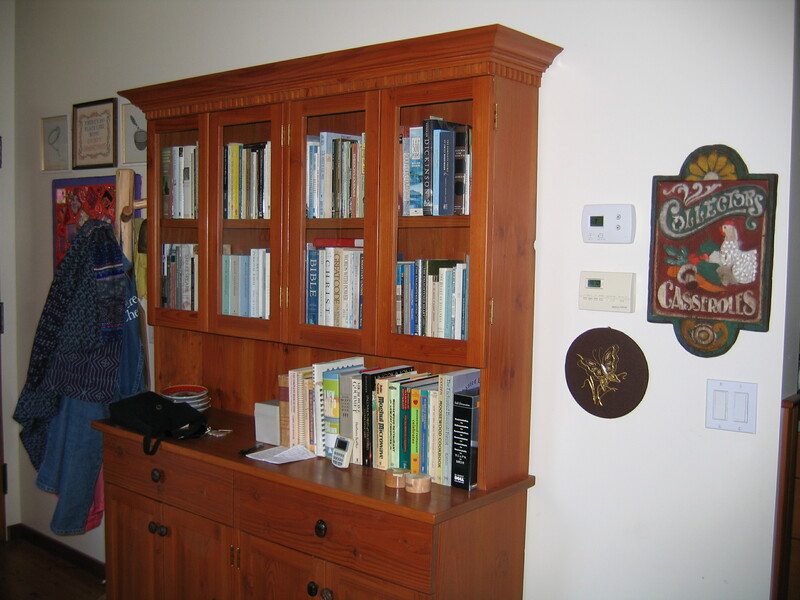 I had Book TV on the television. 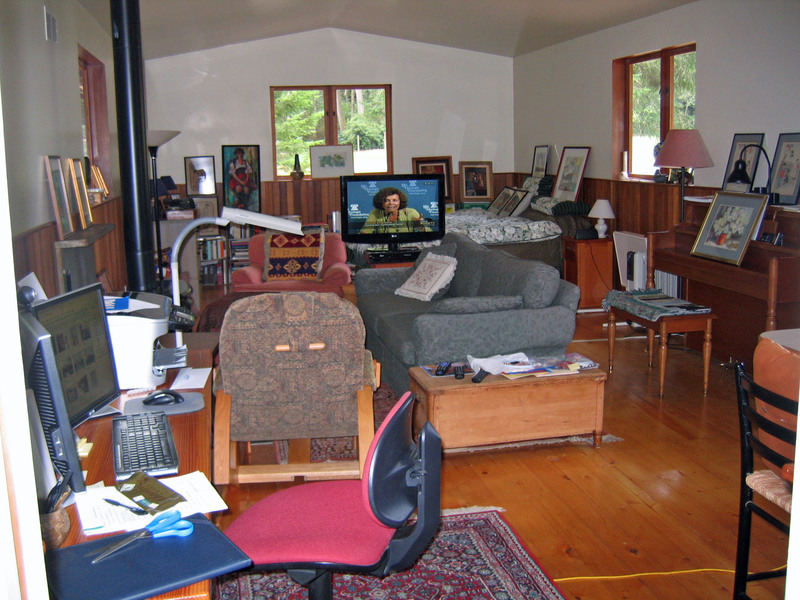 You can see my piano and my office area. Here’s the view from the back of the apartment. 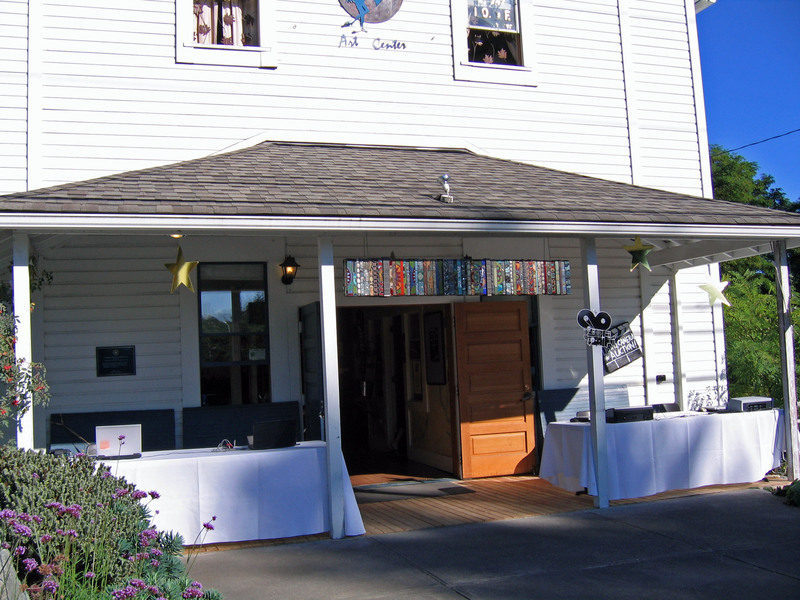 I’ve joined the Vashon Allied Arts, which supports all the arts on the island. 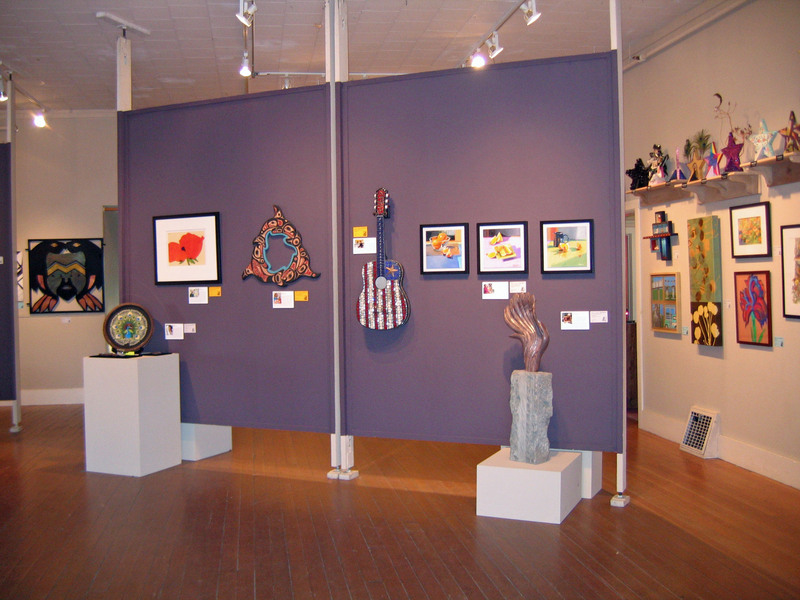 Its offices are in the Blue Heron Arts Center. Here’s the main hall divided for an art exhibition. 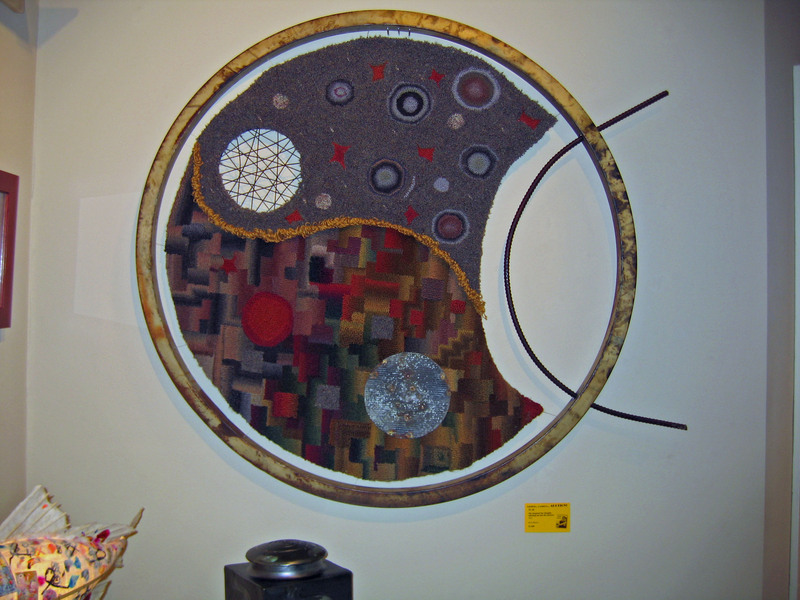 Here’s one of the featured works–magnificent textile art combined with rusted metal in a wooden frame. The artist is Kira Bacon. Geoff has offered to introduce me to her. I’ve subscribed to the Vashon Chamber Music series, a lecture series on women artists, the Vashon Chorale, and Vashon Opera. The calibre of the arts here is mind-blowing. World-class artists live here and they attract their friends and colleagues to join them from all over the country. But I’ve been urged by Vashonites to shush my enthusiasm lest others find out. A new arts center is being developed, though. Caleb and Lauryth have not needed my help so far, which is good for me, as it’s given me time to focus on my own life. Most days I spend in solitude, and I love it. Every day when I leave my apartment, I walk into the forest where I see no one. I do not have to walk down halls, interacting with Charlestown residents. I do, however, see the naked bodies of mostly fat, elderly women in the communal shower and open locker room at the athletic club–something I never saw at Charlestown. Something else I didn’t do at Charlestown–I share the pool with competitive swimmers. Friday was an unusual day. Wide awake at 5:00 a.m., I got up and went to the athletic club. Heretofore I’ve been going at 11:00 for the mid-day lap swim period. While I was eating breakfast, Nan called to ask if I could help with her move. Shortly thereafter, Geoff called to ask if he and Beau could come for a visit, which they did. Then I helped Nan, went to Geoff’s house to get basil Carol had harvested, and to Thriftway for the rest of the ingredients to make pesto. Back home, I got a call from Lauryth inviting me to dinner that evening. After which I went to the Chamber Music concert. I talk with Ernie every day and every evening I send an e-mail message that is delivered to his cubby. He’s okay and he keeps telling me how happy it makes him to hear about the pleasures of my life. As for my vocation, I don’t know what I’m going to be doing from now on.